The Department of Energy’s SLAC National Accelerator Laboratory has started to assemble a new facility for revolutionary accelerator technologies that could make future accelerators 100 to 1000 times smaller and boost their capabilities. The project is an upgrade to the Facility for Advanced Accelerator Experimental Tests (FACET), a DOE Office of Science user facility that operated from 2011 to 2016. FACET-II will produce beams of highly energetic electrons like its predecessor, but with even better quality. These beams will primarily be used to develop plasma acceleration techniques, which could lead to next-generation particle colliders that enhance our understanding of nature’s fundamental particles and forces, and novel X-ray lasers that provide us with unparalleled views of ultrafast processes in the atomic world around us. The DOE has now approved the $26 million project. The new facility, which is expected to be completed by the end of 2019, will also operate as an Office of Science user facility—a federally sponsored facility for advanced accelerator research available on a competitive, peer-reviewed basis to scientists from around the world. The new facility will build on the successes of FACET, where scientists already demonstrated that the plasma technique can very efficiently boost the energy of electrons and their antimatter particles, positrons. In this method, researchers send a bunch of very energetic particles through a hot ionized gas, or plasma, creating a plasma wake for a trailing bunch to “surf” on and gain energy. Researchers will use FACET-II to develop the plasma wakefield acceleration method, in which researchers send a bunch of very energetic particles through a hot ionized gas, or plasma, creating a plasma wake for a trailing bunch to “surf” on and gain energy. In conventional accelerators, particles draw energy from a radio-frequency field inside metal structures. However, these structures can only support a limited energy gain per distance before breaking down. Therefore, accelerators that generate very high energies become very long, and very expensive. The plasma wakefield approach promises to break new ground. 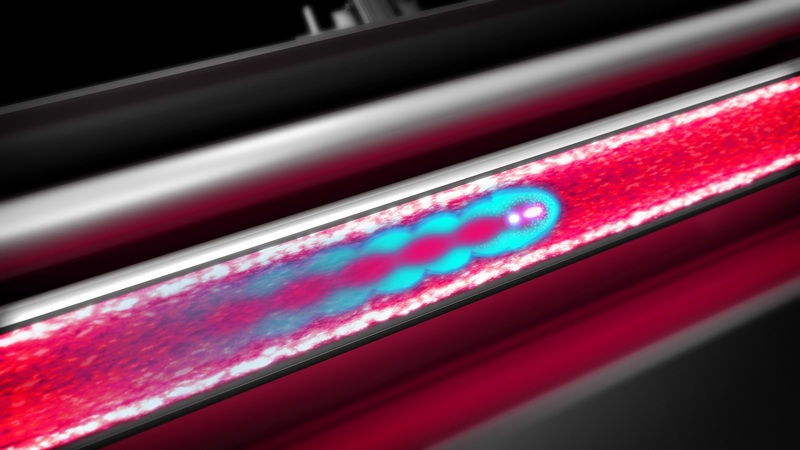 Future plasma accelerators could, for example, unfold the same acceleration power as SLAC’s historic 2-mile-long copper accelerator in just a few meters. The FACET-II facility is currently funded to operate with electrons, but its design allows adding the capability to produce and accelerate positrons later—a step that would enable the development of plasma-based electron-positron particle colliders for particle physics experiments. Other science goals for FACET-II include compact wakefield accelerators that use certain electrical insulators instead of plasma, as well as diagnostics and computational tools that will accurately measure and simulate the physics of the new facility’s powerful electron beams. Science goals are being developed with regular input from the FACET user community. Editor's note: This article is based on a press release issued by SLAC National Accelerator Laboratory.